Apologies that this post is a little late, but earlier this month, I released a new album at my Bandcamp site, and thought it should get a bit of a “plug” here (well, if I can’t do it on my own site, where can I? 🙂 ). 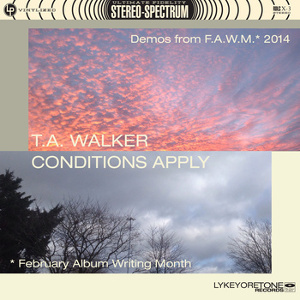 “Conditions Apply: Demos From FAWM 2014” collects together the fourteen compositions I wrote and recorded for this year’s February Album Writing Month (FAWM). The tracks are presented as I recorded them during the month, insofar as I made no further overdubs or re-recording, although I have put all the recordings through a “mastering” application in an effort to impose some sonic order on them. “Conditions Apply: Demos From FAWM 2014” is available now, as a “name your price” download from Bandcamp. You are perfectly welcome to download it for free (just enter “0” as the price), but it goes without saying that I wouldn’t object to receiving something for it (naturally enough)!